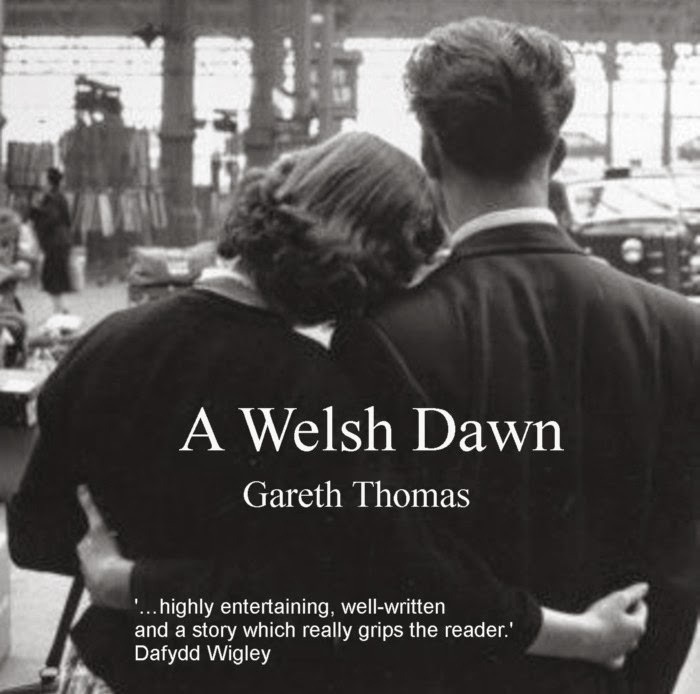 Earlier drafts of ‘A Welsh Dawn’ contained far more Welsh. My original intention was that conversations which would have been in Welsh, should be in Welsh. This involved parallel translations back into English, which, in the end I was forced to admit, complicated the task of reading the book unacceptably. I remain personally attached to the lost dialogue which was written in authentic 1950’s Dyffryn Nantlle ‘tafodiaeth’ (dialect). I had two expert consultants to assist in this. Shán Thomas and Gwynedd O. Pierce whose work is too good to lose. Below are some of the longer sections of dialogue with page references to where they fit in the final printed edition. “ Chwara teg Mair. Fedri di ddim mynnu’i fod o’n siarad Cymraeg.” The headteacher, Mr Griffiths, looked at Mair Owen over his cup of strong tea. Mair was silent. She straightened her back and stared ahead as she did when feeling resentment. She appeared at the door – a once good looking woman in a flowered dress. “Dos o’ngolwg i’r hen gythral!” The door shut with an expressive slam. The elderly Mrs Evans let the curtain drop hurriedly when she saw Tom look her way and shuffled off to the kitchen in the rear where her husband was studying the Caernarfon & Denbigh Herald. Pause for response from her husband. “Ella”. That couldn’t get him into trouble! “Dim byd i gymharu hefo sud oedd hi’n bihafio hefo peilots tua Pwllheli,” thought Mr Evans but said nothing. Twm was sitting in his green Austin A35, a very small car which looked comically smaller after he had crammed his bulk inside. She walked with assumed nonchalance to the gate where Ifan waited. His greeting was not overly romantic. She replied in English, not because it was her natural language but because it was hip and, in the context of Penygroes School, as rebellious an act as eating chips from the paper whilst walking along the road and anyway Natalie Wood spoke English didn’t she? The “bloody” was very out of character for Gwen, but extreme measures were called for to match him today. Gwen looked away feigning indifference. “Dim ots gen i.” This was not a good start. Twenty minutes later they were sitting on a bench in the park eating their chips with cool nonchalance. “ Well i ni fynd cyn bo hir. Dwi ddim isio bod yn hwyr.” Neither, in truth, did Ifan. She looked at him with a certain amount of challenge. Gwen’s heart leapt with a silent cry of triumph but she managed to look controlled and disinterested. “Wn i’im. Pa ffilm sy’na?” Frankly it would have made no difference. There was no hesitation “Wrth gwrs”, he said, staring disbelievingly back at her. Beth Llwyd nearly bit her tongue off regretting the comment immediately. There were places where it was better not to probe. Beth Llwyd laughed, knowing Ifan’s antipathy to the sports staff. He looked up straight into her eyes, grinned at her and she felt 16 all over again. She got up hurriedly to hide her middle aged blushes. “Beth pe bawn i’n deud petha hegar am bobol hefo gwallt coch?” Elsbeth Ty-Capel grimaced and shook her distinctive red hair as all the class looked in her direction. “Neu wallt du fath a brân” There were three candidates for this: Bryn, Meinir or Elen. The class stared at them and the two girls giggled in embarrassment. There was no answer this time. Mr Griffiths switched to safer territory. Bryn’s head rose like a flower greeting the sun. The Headteacher stood up and went over to his sideboard, collected a leaflet which he placed on the desk in front of Ifan. “Os oes gynnoch chi gariad at yr iaith fel y dywedsoch wrtha i, a fel mae Miss Llwyd yn dweud wrtha’ i, y peth gora’ fyddai i ti sicrhau llwyddiant i’r fenter – a gobeithio nad yw hyn ond y cam cyntaf i sefydlu ysgolion eraill o’r un math. Ond cyn i ti wneud cyfraniad mae angen i ti gael gradd dda a llawer mwy o sgiliau diplomataidd. Mae Mr Danials yn Gymro da ac yn athro da hefyd, a gall fod o help i chdi – Paid â gwneud gelynion o bobl fel fo. Ti’n dallt? Ifan found it hard to believe that she could respond so cruelly to his success. But he spoke softly. She looked at him again seeing her own stubbornness in the set of his jaw. She looked into her son’s eyes; soft, but gleaming with certainty and she knew there was no point. She fell into the chair by the fire, quite defeated and stared ahead of her fixedly. “Mam? Mam? ‘Da chi’n iawn?” ventured Ifan quiety. There was no word of reply. “Diolch Mrs Llwyd.” They both looked awkwardly and disbelievingly at the examination result slips in their hands. In the entrance hall Beth Llwyd hugged her protégé and his girlfriend. Gwen looked at Ifan with a grin. Beth Llwyd obviously wanted a moment alone with her favourite prodigy. She ran off. She reached into her bag a produced a small, green volume. “Rwan, Ifan cer i ffonio dy fam!” Ifan did not move. Her mother produced a photo of herself in full starched uniform on the steps of the Nurses’ Home in 1922. “Beth am dad?” asked Ifan. Bryn shrugged and made no comment. He had never felt close to his father, and now he had moved out or “Wedi rhoir gorau i ni”, as his Mother preferred it, his father had become a mildly embarrassing irrelevance. “Wir?” replied Bryn without looking up. He said nothing. Suddenly, he looked up and asked the question that was worried him. That was the third time he’d promised so he had to make it happen. When the hands of the schoolroom clock reached 3:30 the children put their equipment in their desks and waited in silence for Mr Griffiths to dismiss them – a row at a time. “Bryn, Ti’ gw’bod bod dy fam yn dy ‘nôl di heno, ‘dwyt? “Noswaith dda Mr Griffiths”, they chorused and filed out a row at a time. No other parent could greet him by his Christian name. Very few parents knew his Christian name. She was challenging from the start. He made a decision. He remembered Bryn was hoping about awkwardly. Bryn exited with little enthusiasm. “Diolch byth ‘mod i ddim yma ar y pryd”, answered Mr Griffiths. They both laughed ambiguously. “Rwan Phyllis, be fedra i ‘neud i ti? “Dw’i am iddo ddod yn hollol rugl yn Saesneg.” She paused for a response, volunteering no more..
She looked defiantly up at him enjoying the frisson. Mr Griffiths looked hard at her. He refused to answer until she lifted her head. She did so with defiance. She looked up at him with something approaching hate. Mr Griffiths had no option. There was no point in his ending the sentence. Phyllis flowed out of the room with dignity, tears but style. Phyllis sat next to the Rayburn whilst across the small kitchen-come-sitting room Bryn laboured over homework. They both laughed and silence resumed with Phyllis pleased at her insistence on English. She looked once more at the jobs page. Mam!” said Bryn in the familiar rising tone that meant a request. “Man, Pam ma’ rhaid i mi ista hefo’r hogyn Saesnag na’n lle hefo Meirion Tŷ Glas? John Prichard, who had shown no sign of being awake through either presentation, raised an index finger to attract the Chairman’s attention. The language of the meeting reverted to Welsh. Their desertion of Chapel Brygwyn was noted with disapproval, and commented upon. The Reverend Elias had discussed Gwilym and his family with Mr Griffiths at one of their regular meetings. Mr Griffiths was anxious to get away before the Minister started to refight the battle for church disestablishment. They were delighted that Twm’s son was doing a degree. . “Wyt ti am weithio fel athro ar ôl y brifysgol? Roedd Yncl William yn athro ‘lawr yn Abergele; felly mae traddodiad yn y teulu.” They wanted to know about Gwen whom they remembered from Liverpool. It appeared a good moment to mention the reason for the visit. The date of the debate in the House of Commons had been set for July 3rd. It would be followed by a vote which, if won, would empower Liverpool Corporation to issue compulsory purchase orders on 900 acres of Cwm Tryweryn - including Hafod Lwyd. Ifan and his fellow campaigners would be at Westminster that day. But they had heard from Plaid Cymru that the inhabitants of Capel Celyn would not. “Pam? ‘Dach chi ddim i fod i roi’r ffidil yn y to cyn i’r gêm orffan? There was a long, long silence broken only by Mrs Rowlands going to the grate for more hot water and replenishing the tea pot. There were tears in the corners of her eyes which she tried to blink away. Ifor’s silence spoke his uncomfortable acceptance of all his wife had said. There was no point in pressing the matter. When it was time to go, Mrs Rowland embraced the two “bechgyn fein” and gave them each a loaf of bara brith. Mr Rowlands ran them back to the station in time for their train. “Iawn ond sut, clefar clogs?”, shouted a voice. Anna had come prepared. Still standing on her chair she read a piece from the Daily Post reporting that Henry Brook planned to visit the National Eisteddfod in Llangefni in August. Despite calls from prominent figures that the invitation should be withdrawn, the Eisteddfod Council were adamant that Henry Brooke would be a welcome guest. Owen was his mother’s biggest worry. He had looked for jobs, “Chwara teg i’r hogyn. Mae o wedi trio. Mi ath o yr holl ffordd i Bwlhelli i chwilio am waith w’sti.” The trouble was he was losing his confidence, becoming lethargic. They reminded her that the demonstration against Henry Brooke, which she had organised, had been effective. He had cancelled his visit. Anna dismissed this. It had been a gesture but it had not put any real pressure on the Minister. She kissed him on the cheek and went to pack. She was still crying when the bus reached Liverpool. Ifan protested that there was nothing they could do that would be effective. Strikes appeared the best weapon but the unions were not interested. Demonstrations had failed. He looked up. She had ideas what the targets might be. From her jacket appeared a list. Ifan looked at it and at her. This was no joke. She suggested the Temple of Peace in Cardiff because that was where the Council of Wales met. In Liverpool, the statue of Queen Victoria outside Lime Street had symbolic value. In London, her target would be the Ministry where Henry Brooke was based. “Be dach chi’n fwriadu ‘neud felly – ffrwydriadau? bomio? Ifan pushed the list back and left. Her stare burned into his back. She recognised one of the officers as local. Tom Parry looked awkward and did not reply. The second officer responded. Apart from councillors, politicians of all colours and business people, there were men and women of the town who had known Dafydd as “Hogyn o’r dre” . Huw T described him as “Dyn Mawr o dre’r Co Bach” . Goronwy Roberts described him as “a true friend and a gallant fighter for the values that make our lives worth living.” The singing was passionate and the weeping came from deep inside.